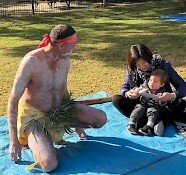 NAIDOC Week (July 9-14th) was celebrated across The Infants’ Home’s early education and care centres, playgroups and Family Day Care Sydney Wide services this week. Our Community Playgroups did art and craft projects using the colours of the Aboriginal flag; Robinson House conducted a bush tucker scavenger hunt, Rigby House did mark making with sand using the colours of the Aboriginal flag; Johnson House made Aboriginal symbols with playdough and Murray House children enjoyed an indigenous music experience. Family Day Care took the children on an excursion to explore an Aboriginal track. The children were able to explore the natural world through their senses as they felt the wood carving, smelt the flora and investigated a range of insects. Other experiences included sharing Dreamtime stories and completing works inspired by the story of ‘The Rainbow Snake’; Gorton House children created woven and painted works on canvas, and Robinson House children wove a serpent into their fence. Whilst we actively embed the Aboriginal and Torres Strait Islander cultures into our programs through a variety of learning experiences, and when engaging in conversations with the children, NAIDOC week gives us an opportunity to further talk about the history, culture and aboriginal achievements in the past and present and show our acknowledgment and support for our local Aboriginal and Torres Strait Islander community. 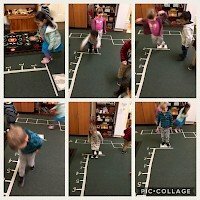 Children have been playing Hopscotch in the indoor and outdoor environments at Johnson House preschool. Hopscotch helps children to manage body rhythm, which is at the core of numerous other skills including building body strength, balance and co-ordination. Hopping on one foot is one of the most complex movements the human body can perform. Hopping also helps to develop cognitive development and helps in building essential neural pathways in the brain. Those same pathways will one day become the conduits for left/right brain thinking tasks such as creativity, reasoning, and self-regulation. The children in Johnson House have been busy re-establishing the worm farm. We were lucky to be able to initially share some worms from the farm in Robinson House and now feeding and checking on the worms have become part of our daily routine. The excitement continued when we were very lucky to receive a donation of additional worms from one of families. The children took turns to use their hands to gently scoop up the worms from the box and then carefully put them down in our worm farm. After we put all the worms in, we engaged in a discussion about what worms like to eat and how we continue to care for them as well as their role in helping the environment. 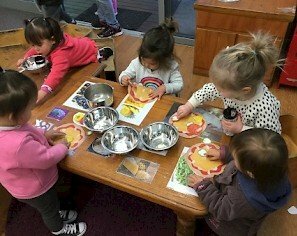 A highlight for the month in Murray House Infants has been exploring pizza making through pretend play using variety of media (play dough, sand, and cut out pictures). After many discussions about favourite ingredients, children began to work with real food items such as capsicum, pineapple, olives, tomatoes, mushroom, and rice cakes for the base. Many learning opportunities were observed as educators and children talked about food shapes, colours, and textures. The children have been encouraged to use their senses, as well developing language skill as they listened and followed the steps to create their own pizza – coating the base with tomato paste, chopping the veggies, etc. 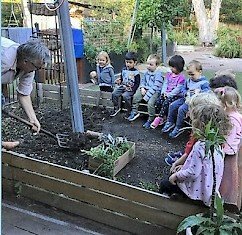 Children in Gorton House have taken great joy in their journey to create a new veggie patch with educator Russell. They have been planting herbs (rosemary, parsley, mint) and veggies (lettuce, broad beans, carrots) and taking advantage of all the learning opportunities that gardening can provide: the lifecycle of plants, how weather and the environment can affect plant grow, difference textures of different plants and how these expand our senses, and how to care for and nurture growing things. They greatly look forward to watching their plants grow and produce tasty tid-bits for nibbling on. Leading up to NAIDOC Week, the Rigby children have been investigating the colours of the Aboriginal flag. The educators have used the children’s interest in mark making, to develop the children’s awareness of the flag’s colours by providing red, yellow and black sand. The children have been enjoying this sensory experience and creating marks in the sand. As the children play the educators talk about the meaning of each colour- red for the earth, black for the people and yellow for the sun. Children in Robinson house continue to extend their learning about Aboriginal and Torres Strait Island culture. They explored the Aboriginal Dreaming story of Emu in the Sky. This story encompasses the children’s fascination with space and Aboriginal Dreaming stories. This is the story of an emu that was sent to live among the stars and if you look closely you can see it in amongst the Southern Cross. Emu in the Sky has inspired their art and imagination. At Little Wombat Early Learning & Care Family Day Care service, Aki (the educator) saw a different use for an empty baby formula tin. 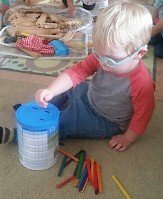 Cutting some holes in the lid, and getting together a collection of coloured paddle pop sticks, provided a great tool for some fine motor development fun. The children enjoyed posting the paddle pop sticks into the holes of the lid and then hearing the stick bang as it dropped into the tin. This also provided a great opportunity to explore colour and counting as they labelled and counted the sticks that were posted. When all the sticks were gone, the children thought it was fun to pull the lid off, rattle the tin and tip the sticks out and start again! This simple activity encouraged the children to develop a range of skills and process such as problem-solving as they manipulated objects and experimented with cause and effect and trial and error. 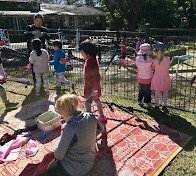 The group at Northern Beaches Family Day Care play session have recently been investigating snakes and reading about Warnyarra the Rainbow Snake. A small world snake play experience was set up for the children to explore. Annabelle then took this interest over to the long sheet of paper that was placed in the hall for the children to draw on. Annabelle drew a long snake on the sheet which we then counted was 15 footsteps long!! !